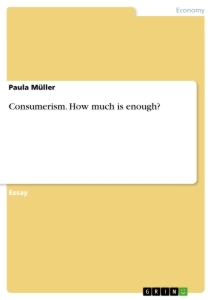 Consumerism: How much is enough? Day for day, we are faced with advertisement telling us what we need in order to be happy. And even if you are already content with your life there is always a way to achieve even more happiness. “Think big” as IMAX says; “Nothing is impossible” according to Adidas; “Live better” with Walmart; “Just do it” for Nike; Visit Disneyland, “the happiest place on earth”; Buy “beauty, power and soul” in an Aston Martin; “Live” with IKEA and “open happiness” with Coca Cola. You require material goods for everything these days: Rolex and Porsche for success, an Apple or Samsung smartphone for friendship and further communication etc. And whenever there is a new model or edition of a product with improved features it must improve your satisfaction, as well, right? Nonetheless, the people in the big industrial nations who can afford to buy so many goods are not necessarily happier. According to the “Happy Planet Index”, which measures the human well-being, the USA is for instance as unhappy as the majority of African States. In Europe there are only three countries achieving the third lowest index, Ukraine, Romania and Moldova. All the other states are even below that rate. Therefore, the happiest countries are mainly South Americans. It can be argued if this index is reliable, if the methods are appropriate or whether happiness can be measured in the first place. But looking at other studies as well, the researchers seem to generally agree that the people’s happiness is not necessarily related to the level of consumption and the economic wealth. In addition to the lacking positive effect of consumption, it is not sustainable and on the long term our finite resources will be exhausted. So there definitely is the need for change and we need to set a limit to consumerism. But how much is enough? For this essay, the question “what is too much” will not only be discussed in a quantitative way but also qualitatively since the problems created by too much consumerism are not only caused by the amount of consumption but also by its quality like sustainable consumption. In the following two paragraphs two main and superior ideas will be explained but as their further analysis would go beyond the scope of this essay and too far away from the main topic the actual outlining of the limit for consumerism will be discussed later. Nevertheless, the latter part can be referred back and related to the main ideas. From an ecological and sustainable point of view, you could argue that a limit should be set at the point where the products become unsustainable, in an ecological sense, in order to keep the resources as well as for ecological reasons and future concerns. That is to say, that any product which exhausts resources in an unsustainable way, for instance if it cannot be recycled or if it is environmental harmful, should not be consumed and is “too much”. Therefore, sustainable products must be defined which will not be discussed in this essay. Secondly, it can be observed that consumerism can be seen as a Zero sum game. In other words, the overconsumption by one person or nation leads to an “under-consumption” by another person or nation. In order to achieve an equal distribution for ethical reasons, which would fit to the idea of a sustainable limit, everyone must consume the same amount of goods and any further consumption would be considered as too much. The problem here is that an equal distribution in practice does not only concern the consumer’s behavior and the amount of consumed goods but also distribution channels, geographical aspects and many other factors. Besides, it seems impossible to figure out concrete ratios for the goods in this essay or also in general. This is why the limit for consumption in this essay will be outlined using different ideas and models as a basis. But in the end, the result can be seen as appropriate guidelines for the definition of ratios in order to get closer to an equal distribution. It also includes sustainable aspects as a reference to the first idea. According to the definition of consumerism the following main part of the outlining is based on the theory of needs. It must be mentioned that it is in many cases subjective to judge about how much is enough and often limits cannot be set generally and are rather individual; they might vary from case to case. Therefore, there will be a general statement about the limit and then some cases will be exemplified with sub-limits of the main limit. The cases are chosen by their importance which can concern their frequency in our every-day life or relate to the size of investment they represent. The limits and especially the sub-limits are often defined by what the people might generally agree to in order to achieve a general and relatively objective point of view. Sometimes the general opinion is divided. In that case the limit will be described as “arguable”. Due to the limited scope of the essay some ideas and arguments will be discussed less than others. In general, the theory of needs created by the Skidelskys will be used since it has a broader meaning than Maslow’s hierarchy of needs and also includes it, which will be exemplified. According to the Skidelskys natural needs have the following features: They are universal. So everyone has them; they are final and not a need required for the satisfaction of another need; Moreover, needs are sui generis and cannot be replaced; they are also indispensable, which is an arguable trait in many cases. CSR & Organisational Identification: To Which Extent Do CSR Initiatives Achieve Organisational Identification? Violence and Consumerism in Bret Easton Ellis’s "American Psycho" and Chuck Palahniuk’s "Fight Club"
Cross-Cultural Consumer Behaviour. A comparison between Germany and the U.S.